Semi-conductor nanocrystal quantum dots (QDs) are a prime example of a nanoparticle (NP); defined as a nano-object [a material with one, two or three external dimensions in the nanoscale (1-100 nm)] with all three external dimensions in the nanoscale1; that is intended for use in nanomedicine2. Whilst a plethora of alternative, hybrid NPs are also available that exhibit similar properties to QDs, such as Fe2O3 or Au NPs with an incorporated polymer shell, as well as superparamagnetic iron oxide NPs (SPIONs)3, which are easily synthesised with respect to 'core-shell' technology, QDs are unique in their characteristics exhibiting a narrow excitation/emission wavelength, as well as increased fluorescence and photostability which enables them to be ideal tool for many biomedical applications, such as therapeutics and diagnostics4,5. As with all nano-based materials or NPs, QDs have received a heightened degree of attention in the last two decades6 due to their physico-chemical characteristics and as to what their potential adverse effects may be following their, inevitable, exposure to humans7. The intended application of QDs suggests that only intentional exposure, via injection, would be a potential risk to humans and their health. Whilst this is undoubtedly correct under the assumption of QDs being applied within a clinical setting, the notion of risk (hazard x exposure) is also perceived through the manufacturing of QDs, and thus the possibility of the inhalation of QDs by humans is a realistic problem that requires immediate attention. It is also important to point out that, considering the major exposure routes of NPs to the human body8, QDs may also pose a risk towards both the skin and the gastro-intestinal tract. It is difficult to understand the notion as to why QDs may be of risk to the gastro-intestinal tract, unless (i) they are used as a 'drug-device' via oral administration, which is not the primary intention for the application of QDs within nanomedicine, or (ii) they locate in this region following injection and or inhalation. It is highly unlikely that the latter could occur however, since if the QDs, or NPs in general, are to translocate to an (another) organ following their administration (either via inhalation or injection), they would most likely locate within other organs9, such as the liver10. Furthermore, following such an 'exhaustive' translocation process it is debatable, despite their suggested heightened stability, as to whether or not the QDs would still be 'complete' QDs, and not simply fragments of the original NP itself; this aspect is beyond the scope of the present review, but is well discussed within the article of Geys et al.11 as is becoming an ever increasing research scope within the field of nanotoxicology12. This of course highlights an ongoing issue regarding the translocation and subsequent 'secondary toxicity' of NPs in the human body - an area that is receiving increased attention and investigation9. In addition to this, there has also been increased research into the effects of QDs on the skin13-15. Whilst such research is important to conduct in regards to gaining a thorough risk assessment16 of any NP type, the applicability of such a research outlook towards the specific and intended application of QDs does not warrant immediate or imperative investigation compared to how QDs may affect cells relative to either the human lung or bloodstream. It is also prudent to highlight that research into the effects of QDs on blood cells (i.e. red blood cells or platelets) is lacking. This is true for all NPs in regards to their effects on human blood cells. Although much of the research within the field of nanotoxicology and the effects of NPs on human health focusses upon the immune system, little has actually delved into the effects of how human blood cells 'see' NPs. Of the limited research conducted (e.g.17), extremely interesting findings have been reported. Such as the notion that red blood cells can internalise NPs of <100nm despite the fact that they express not phagocytic properties18. Furthermore, many studies have assessed the haemolytic potential of NPs. The haemolysis assay, although dated, is still considered an adequate and representative model biochemical protocol to determine how xenobiotics may affect red blood cells19. This assay therefore, is especially advantageous as a short-term in vitro assay to determine NP toxicology20. In the study of Lu and colleagues, the haemolysis assay was used to assess the effects of a series of metal oxide NPs, including alumina, magnesium, silica, zinc, copper and nickel. Whilst the majority of metal oxides assessed showed no haemolysis, exposure of cerium dioxide and a form of alumina, in addition to nickel resulted in a significantly elevated haemolytic effect upon human red blood cells21. Also, a recently study by Zhu et al.22, the effects of anionic polyurethane NPs were assessed for their platelet activation and haemolytic capability. In fact, a number of different particle types, such as hydroxyapatite and tricalcium phosphate NPs23 and iron oxide NPs24 have been assessed for their interaction with human blood by using the haemolysis assay. In addition to this, recent research using aqueous synthesized QDs with a Cd core has shown that QDs can have a blood circulation time, as determined by serum biochemistry, of between 15-80 days25. Su and colleagues25 reported that the aqueous QDs also located within the liver of female Balb/c mice after 0.5 to 4 hours, although no significant toxic (or lethal) effects were observed. Despite such findings however, and considering the primary intended application of QDs, an understanding of how QDs may 'interact' with the human body is limited. Why is there a limited understanding of the biological interaction of QDs? Despite the benefits of QDs posing a considerable advantage to the potential clinical advancement in the identification and treatment of diseases (i.e. tumour formation)2,4,26, concerns as to the human exposure of QDs have been raised based upon both (i) the surface properties (associated with the size and shape) of QDs and (ii) the materials used to construct these core-shell NPs. Usually, these highly fluorescent NPs range in size (core) from 1nm to 25nm in diameter and their fluorescent properties are strongly correlated to their size, which, in terms of QDs, also corresponds to their shape (in regards to a change in the diameter of the QD core)2,26. Also, the increased anxiety associated with the potential risk associated with human exposure to QDs is due to the fact that QDs consist of a 'toxic' core material; commonly either cadmium telluride (CdTe) or cadmium selenide (CdSe), , and are covered with a shell coating, such as zinc sulphide (ZnS)4. Although it is suggested that such a shell coating is 'biocompatible'27, the presence of Cd as a core material, at the nanoscale, exudes the notion that QDs could be 'lethal', and possibly similar to that observed with Cd in the bulk form. The complexity of QDs therefore, is a major reason as to why the knowledge base surrounding QDs is currently limited - a similar problem concerning all hybrid NPs3,4. 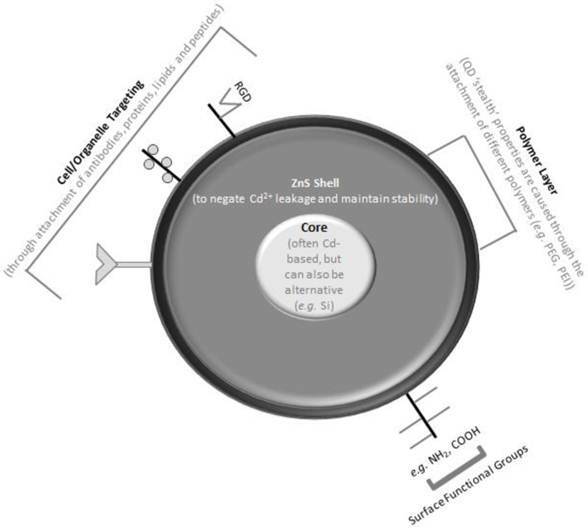 It is important to note however, that although Cd is used as a prominent core material for QDs, there are many other core materials are available with inorganic cores, such as silicon28. Whilst it is perceived that such alternative core materials could negate the adverse biological effects (as discussed within this review)29, investigation into how such 'alternative-core' QDs impact upon biological systems is in its infancy, and much of what is known regarding the biological interaction of QDs is based on Cd-core QD NPs30, as thus forms a basis within the present review. Due to the limited understanding within the field therefore, the present review aims to discuss and summarise how the specific physical characteristics of QDs contributes to their biological impact and how these factors relate to their clinical relevance. Understanding the absolute physico-chemical characteristics of QDs when studying their biological interaction is imperative. From a historical perspective, the surface of NPs has formed the basis for increased research, and is considered to be one of the driving characteristics of why an increased adverse biological effect was first observed following NP exposure12,31,32. Whilst the surface area and reactivity33 are still considered extremely important characteristics in relation to the biological interaction for any NP type34, understanding the key surface characteristics of core-shell NPs, such as QDs is essential to deciphering how they may interact with different biological systems, since changes to the surface properties are suggested to significantly alter the manner in which biological systems may 'observe' NPs35, such as the adsorption of proteins36 and the kinetic/environmental changes that happen to this adsorbed protein corona37. Due to these issues, it is imperative that a thorough understanding of the specific physical (surface) characteristics of the NP being investigated are obtained in situ (e.g. in the same buffer and environment (i.e. pH) as the biochemical/biological tests are performed)34. It is also essential that information pertaining to the NP prior it to being placed in a biological environment. This is particularly relevant to QDs, as well as the many other core-shell NPs, as it is possible to attach a wide variety of biologically-based molecules to their surface, such as proteins, peptides and lipids for cellular targeting2,4,26 (Fig. 1). The use of any of these surface attachments can also have a significant effect on the size of QDs, with the final diameter suggested to be able to range from 1nm to 100nm4. This potential change in diameter of the QDs further emphasises the necessity to understand the basic characteristics of the NP prior to any biological testing, since, depending upon the specific NP type, biological media can promote the agglomeration/aggregation of NPs and thus change the surface properties of any NP38. Another surface characteristic that is paramount in the synthesis and proposed application is the addition of a polymer coating layer (Fig. 1). Polymer coatings can also be attached to the surface of QDs, and have an additional effect upon their size (up to >40nm in diameter)4,26. It is intended that the use of polymer coatings on NP surfaces will form 'stealth' NPs, which will be able to be targeted to specific organs within the body in order to diagnose, treat or prevent disease39,40. Many different forms of polymer coatings are possible for use on the surface of QDs, such as poly-vinyl alcohol (PVA), poly-meythl methacrylate (PMMA) and poly-lactide-co-glycolides (PLGA). The most commonly and popular polymer shell used, especially with QDs due to their intended application within nanomedicine, is poly-ethylene glycol (PEG). The potential benefits of using PEG as a coating on the surface of NPs can be related to previous findings in the drug delivery and drug design literature39,41. It has been shown that the addition of a polymer PEG coating on particle-drug complexes is highly advantageous as it promotes a 'steric repulsive barrier' resulting in a lack of recognition by phagocytic cells, responsible for cleaning foreign particles from the blood and tissue42-45. It was further reported by Porter et al.42 that upon contact with the cell or organ that the site-targeted polymer PEG coating is negated by a specific interaction mechanism between the particle-drug complex and the cell or organ. Research into the effectiveness of PEG as a surface coating for nanomedicine has shown it to be advantageous in the targeting ability of cationic lipid-nucleic acid NPs46, as well as demonstrating that this polymeric material is of low toxicity47, thus ideal for use on the surface of QDs. The effects of applying a PEG coating to the surface of QDs have shown similar effects. In a study by Zhang et al.48 the toxicity of PEG coating was investigated. It was reported that following the treatment of both lung (IMF-90) and skin (HSF-42) fibroblasts with PEG-silica coated CdSe/ZnS QD with doses of 8 and 80nM, that no significant effects on the cells' ability to undergo mitosis was observed, however a small increase in apoptopic/necrotic cell death was found at both the low and high concentrations respectively. Zhang et al.48 also stated that the PEG-silica coated CdSe/ZnS QD showed no inflammatory response or heavy-metal-related toxicity even at 80nM. In addition, Duan and Nie49 also investigated the effects of a PEG surface coating on QDs. It was initially reported that amine surface coated QDs were highly cytotoxic, observed via the MTT assay, after exposure for two hours at 1nM in Hela cells. Subsequent addition of a PEG/polyethylenimine (PEI) (PEI-g-PEG) surface coating to the amine coated QDs caused the level of toxicity elicited by the amine QDs to significantly decrease at two hours at a concentration of 1nM. Duan and Nie49 further examined the ability of these PEI-g-PEG coated QDs to be taken-up by the Hela cells over two hours. It was observed that spontaneous uptake and intra-cellular localisation did occur over the two hour period. The results of 49 could be further supported by that of Clift et al.50,51 in which it was reported that NH2 (PEG) QDs (both chemical groups were deduced to be equally active on the NP surface) did enter a macrophage cell-line over a period of two hours exposure at 40nM. It was also found that this concentration resulted in a significant depletion in glutathione levels up to 48hrs, although no cytotoxicity, pro-inflammatory marker stimulation or effects upon cellular calcium signalling in vitro52 were noted for this form of surface modified QDs. Impression of the physical state of a quantum dot (QD) nanoparticle. 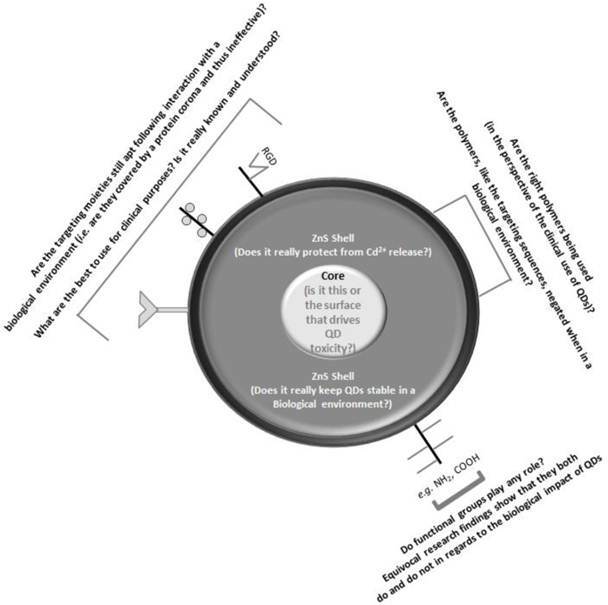 The figure shows a schematic (not to scale) perspective of the core-shell technology highlighting the different core, shell and polymer materials that can be used to synthesize QDs, as well as the plethora of different modifications that can be adapted to the surface of QDs. In summary therefore, whilst a variety of different surface markers/modifications can be easily attached to the surface of QDs (Fig. 1), it is essential that a complete understanding of precisely what is attached to the surface, and how, is gained prior to any biological/biochemical testing strategy is initiated, since it has been proven (as discussed above) that the minimal difference in the (surface) characteristics of QDs can elude to a significantly different biological interaction6. Since manufactured NPs are predominantly produced from a 'bulk' material via 'top-down' processes, there is constant debate as to whether or not NPs elicit any adverse effects as a result of their material type, or due to their nanoscale properties. This is particularly prominent within the core-shell NP technologies, such as QDs, due to their heterogeneous composition. Is it only a material effect? Cd is a highly cytotoxic heavy metal and is used within a wide array of applications such as a colour pigment in paints, as well a major ingredient within power batteries53,54. This non-essential element can be used in many different forms, such as CdTe and CdSe, as within the core of QDs. Research into the toxicity of bulk Cd has been based mainly on the effects of Cd ions (Cd2+). Cd2+ can severely disrupt the function of the mitochondria of cells, particularly in the liver, through inhibiting the oxidative phosphorylation properties of these organelles subsequently causing cancer55. In addition to bulk Cd being a known carcinogen, Cd2+ have also been found to cause a depletion of glutathione, reactive oxygen species (ROS) production and lipid peroxidation in cells56. Furthermore, Cd2+ has been found to cause both carcinogenic tumours in vitro and in vivo following exposure, as well as causing cell death via apoptosis54-55,57. It is clear therefore, that the core material of QDs, or the most commonly used core material at least, is adverse towards normal cell homeostasis, and in some instances potential carcinogenic towards humans. Why therefore, can Cd, or Cd based derivatives, despite being an optimal material (or element) as an image contrast agent (i.e. for diagnostics), be used as the main (core) constituent of QDs? Can QDs elicit a NP-associated effect? In order to gain an insight into this issue, Derfus et al.27 originally investigated the possible toxicity of QDs. In this study, Derfus et al.27 studied the toxic effects of 'naked' QDs (QDs with no shell material) with a CdSe core and tricytll phosphine oxide (TOPO) surface coating (TOPO capped) on primary rat hepatocyte cells, via the MTT assay. Initially, it was found that these TOPO capped QDs caused no deleterious effects on hepatocyte metabolic competence after exposure for eight hours. Subsequent analysis however, following exposure to ambient air for 30 minutes, as well as UV light for eight hours demonstrated these QDs to significantly decrease hepatocyte cell metabolic activity. A concentration-dependent toxicity was found to occur, which was related to a release of Cd2+ from the QD core. It was further concluded that the release of Cd2+ was due to the oxidation of these NPs within the specific experimental/environmental conditions. Derfus et al.27 concluded therefore, that QD toxicity was related to the release of Cd2+ form the core, and that QD toxicity is relative to the specific environmental and experimental conditions in which they are exposed to cells. It was subsequently hypothesised by Derfus et al.27 that the addition of a shell to the QD core, such as zinc sulphide (ZnS) or dihydrolipoic acid, or even a polymer based material, such as polyacrylate, or PEG would reduce the level of oxidation, inhibiting QD toxicity. Although 27 did show that the use of a ZnS shell negated the decreased level of cell metabolic activity following treatment of hepatocyte cells with TOPO capped QDs these findings did not provide holistic evidence that ZnS could inhibit any QD-associated toxicity. Thus, there is still much debate as to whether or not the Cd core is responsible for QD toxicity. Shiohara et al.58 investigated the cytotoxicity of mercaptoundecanoic acid (MUA) CdSe QDs, which were synthesised in TOPO with sheep serum albumin (SSA), on Vero cells (African green monkey's kidney cells), primary human hepatocytes and Hela cells. It was observed that the Vero cells induced a significant depletion in cell metabolic competence after 24 hours exposure with a series of concentrations up to 10mg/ml. No effects were shown with either the hepatocyte or Hela cells after this time. Subsequent analysis via flow cytometry, found a dose response to occur in Vero cells, following treatment with these TOPO MUA-SSA capped QDs after 4-6 hours. It was further observed that this dose response induced an increased staining of cells with the fluorescent probe propidium iodide (PI). PI is a marker of cell death and can only enter cells if the membrane is disrupted. Thus it was suggested by Shiohara et al.58 that the Vero cells were undergoing necrotic cell death. It was concluded in contrast to Derfus et al.27 that this observed cytotoxicity and cell death was due to the TOPO MUA-SSA cap on the QDs and not the QD core. Hoshino et al.59 further supported the conclusions of 58 following investigation of the physiochemical properties of a series of five surface modified CdSe core/ZnS shell QDs, including negatively and positively charged QDs. It was observed that negatively charged, COOH chemical surface coated QDs were less toxic compared to positively charged, amine coated QDs to mouse lymphoma EL-4 cells over 12 hours. It was subsequently concluded by Hoshino et al.60 that the type of QD surface chemistry (coating/charge) is an indicator of their toxicity and not the Cd core material. Studies by both Chan et al.61 and Guo et al.62 also refute the conclusions of Derfus et al.27. Investigation by Chan et al.61 reported TOPO capped CdSe QDs to cause a significant reduction in human neuroblastoma IMR-32 cell metabolic activity (MTT assay) at concentrations of 150nM and 300nM after 24 hours. Chan et al.61 subsequently concluded that the observed toxicity caused by the TOPO capped QDs, was due to their organic coating and not the QD core. Additionally, Guo et al.62 reported CdSe QDs coated with F-68 CTAB and Sodium Dodecyl Sulfate (SDS) to cause significant cytotoxicity (as assessed via the MTT assay) to HepG2 cells over a 72 hour period. The cytotoxicity observed by Guo et al.62 was attributed to the increased toxicity observed with both the F-68 CTAB and SDS surface modifications and not the CdSe core material. Subsequent analysis by Guo et al.62, in contrast to the findings of 58, reported that the F68 CTAB SDS coated CdSe QDs caused heightened toxicity eliciting cell death, comparable to Cd toxicity, via apoptosis and not necrosis. In order to determine if the surface charge was responsible for QD toxicity, Lovric et al.63 examined the effects of both green (emission λ - 530nm) and red (emission λ - 692nm) positively and negatively surface charged 'naked' CdTe QDs in rat pheochromocytoma (PC12) neural and N9 murine microglial cells over a 24 hour period. Initial assessment of their toxicity over 60 minutes observed the green negatively charged QDs to cause no significant effect on cell metabolic activity (using a version of the MTT assay) following treatment for 30 minutes and 60 minutes at concentrations of 1µg.ml-1 to 10µg.ml-1 in rat PC12 cells. Subsequent analysis over 24 hours showed, in comparison to 59, that the positively charged QDs were greater at reducing the cell metabolic activity (MTT assay) of PC12 and N9 cells than the negatively charged QDs at concentrations of 10µg.ml-1 to 100μg.ml-1. Geys et al.64 also assessed the contribution of surface charge towards the biological impact of QDs. It was observed that carboxylated QDs elicited a heightened negative effect upon male Balb/c mice after 1hr exposure to 144-3600 p/mol per mouse via intravenous injection in the tail vein. It was reported that the negatively charged QDs caused an increased thrombosis within the vascular circulation compared to positively charge QDs, although the latter also did show signs of thrombotic injury in vivo. Subsequent analysis, with lower concentrations of QDs (1.44 to 144 p/mol per mouse) also showed that surface charge played a pivotal role in the biological impact of QDs. Investigation of the dry and wet weight of the animals, as well as the platelet aggregation state and inflammatory state of the animals' lungs (bronchiolar lavage fluid analysis) all showed that, in contrast to Lovric et al.63, although positively charged QDs elicited an altered biological response, the negatively charged QDs caused a significant reduction in the homeostasis of the animals. It was therefore concluded by Geys et al.64 that surface charge is a major driving factor regarding QD toxicity. This issue is further described and discussed in detail within the recent review by Hoshino and colleagues65. Whilst Geys et al.64 also assessed the Cd content of the lung, liver and blood of the animals (to determine QD concentration), the findings of these studies were not able to determine whether or not the Cd core or the surface charge was responsible for these toxic effects. In a subsequent study by Clift et al.51, the effects of surface charge and each material aspect of QDs (i.e. core only vs. shell only, etc.) were studied. It was observed that organic surface coated QDs (with a TOPO/TOP/Decane organic surfactant layer on the surface) were highly cytotoxtoxic (as assessed via the MTT assay and lactate dehydrogenase release) compared to both negatively (COOH) and positively (NH2 (PEG)) QDs at concentrations of 20nM to 80nM. It was further observed, that the Cd core material could, if released from the core of the QD, elicit the strongest cytotoxic response compared to the complete QDs and ZnS shell only. Investigation using inductively coupled-atomic elemental spectroscopy (ICP-AES), found that the amount of Cd released from organic QDs was insignificant when internalised within cells, however in the absence of cells, or in an environment of pH 4.0 (indicative of a lysosome), a significant Cd release was observed51. The ability for the Cd core to be released from either the COOH or NH2 (PEG) QDs was not studied however, since these were not found to be highly cytotoxic. Despite this, since both the COOH and NH2 (PEG) QDs were found to be located inside lysosomes/endosomes66 up to 48 hours after exposure at 40nM particle concentration, for which this highly acidic environment was observed to contribute to the decrease in fluorescent stability of these QDs (suggestive of a fragmenting of the NP)50, it could be suggested that the Cd core could also be released from these surface functionalised QDs. Thus, to further understand precisely which characteristic of QDs drives their associated adverse effects requires further deduction. Irrespective of the driving characteristics of QD toxicity, it was further demonstrated by Lovric et al.63 however, that QD toxicity increased concomitantly with a decrease in size, with the green QDs found to cause a significantly greater decrease in PC12 cell metabolic competence, suggestive of cell death, compared to the larger red, positively charged QDs after 24 hours exposure. The size of QDs was further found to be specific to the localisation of the NPs inside the cell, with the smaller, green QDs observed to penetrate into the nucleus, possibly causing damage to the cells deoxyribose nucleic acid (DNA) content, and thus attributed as the potential process responsible for the increased cytotoxicity observed. The finding that QD size could be relevant to their toxicity supports previous literature that examined the toxic effects of environmental air pollution particles, suggesting particle size to be a component responsible for NP toxicity12,32, as well as highlighting another characteristic responsible for QD toxicity (in addition to the core and specific surface coating/charge). Additional investigation by Lovric et al.63 examined the effects of pre-treating PC12 cells with antioxidants, specifically N-acetyleysteine, and trolox to determine if the effects observed were mediated via ROS and oxidative stress. It was demonstrated, that pre-treatment of PC12 cells with N-acetyleysteine, at a final concentration of 2mM, and not Trolox or bovine serum albumin (BSA) (both 1mM - 2.5mg.ml-1) was found to negate any form of cell death to occur, suggesting that this effect may be mediated via ROS production. Subsequent research by Lovric et al.67 showed that 'naked' mercaptopropianic acid (MPA) coated CdTe QDs inhibit human breast cancer (MCF-7) cell function. In addition to the observed reduction in cell metabolic competence (MTT assay), the MPA coated QDs, at concentrations of 5µg/ml and 10µg/ml, were found to cause increased levels of ROS production in MCF-7 cells following treatment for 30 minutes, as determined by imaging of dihydroethidium (DHE) in MCF-7 cells. Similar to the DCFH-DA reaction in which ROS production is determined by the level of fluorescence, DHE detects the extent of oxidative stress and ROS production in cells, by oxidising to ethidium, which is highly fluorescent. The increased production of ROS was further attributed to the decrease in cell viability, demonstrated via membrane blebbing and decreased cytochrome c production. Furthermore, the MPA coated QDs were found to be present within the mitochondria of the MCF-7 cells, causing a significant change in morphology, with a reduction in the length observed over the 24 hour period. These findings were attributed therefore, in support of Guo et al.62, to the QDs causing cell death via apoptosis. Recently, further research into the ability of QDs to produce ROS and cause oxidative stress has been performed by Chan et al.61. As previously mentioned, 63 demonstrated TOPO capped QDs to significantly decrease cell metabolic competence after 24 hours at 150nM and 300nM in IMR-32 cells. Chan et al.63 attributed this observed toxicity to an increased production of ROS, assessed via the DCFH method, following treatment for 24 hours at both 150nM and 300nM in IMR-32 cells. Using less than 50% diluted concentrations of those used by 63, Clift et al52 showed that COOH and NH2 (PEG) QDs could cause an oxidative stress environment, measured via the decrease in the intracellular thiol glutathione (GSH), in J774.A1 macrophage cells after 48 hours exposure at 20, 40 and 80nM particle concentrations. The organic QDs used in the studies of Clift et al.50,51-52,66 were also assessed for their ability to cause a loss in GSH levels over time. However, due to the nature of their increased cytotoxicity, as previously mentioned, any decrease in GSH content was associated with this characteristic. It was though found that organic QDs could alter the intracellular calcium signalling, similar to that of ultrafine carbon black (ufCB), in J774.A1 cells as measured by the FURA2-AM method. Whilst this observation could also be associated with their cytotoxicity, the notion that QDs could elicit similar effects to ufCB, a surrogate for air pollution particulate, is intriguing and requires in-depth analysis to determine if other similarities do exist. In summary, the effects of QDs are, in fact, well studied, however only a few clear observations can be thought of as consistent. The most notable of which is the fact that an organic coating can elicit heightened adverse effects irrespective of their other surface characteristics. The understanding as to whether or not it is the core, the material, or the QD itself that drives the adverse effects reported is equivocal, but it seems to be dependent upon the specific QD used and what environment it locates. It is apparent however, that problems lay in determining precisely how apt QDs are for clinical purposes, since many different surface coatings, functionalisations and sizes of QDs have been studied with no clear outline as to what types of surface coatings, functionalisations and sizes are intended for actual use in a clinical setting. Despite these differences, it is also prudent to highlight that whilst many of the subsequent biological/biochemical effects have been investigated and published, many suggest that the manner in which the QD 'interacts' with the cell, and where the QDs locate could drive such effects (i.e.63); a notion that is well accepted already within the field of nanotoxicology68. Therefore, what is known about the actual 'interaction' (i.e. the uptake mechanisms and intracellular localisation) of cells and QDs? How do QDs 'interact' with biological systems? As previously mentioned, Lovric et al.63 suggested that the location of QDs could be pertinent to the toxic and adverse cellular responses associated with these highly fluorescent NPs. Despite this, an understanding of the actual cellular process of the uptake and sub-cellular localisation and distribution of QDs is limited. As previously highlighted in the present review, as well as in reviews by 6,69-70 it was concluded that the surface coating has a significant role in the biological interaction of QDs, and thus in the cellular uptake and intracellular localisation of QDs. Examination of the uptake processes and sub-cellular localisation of QDs, has found that avidin-conjugated CdSe/ZnS QDs undergo endocytosis into endosomes within in eukaryotic cells following live cell laser scanning confocal microscopy71. Also, investigation of CdSe/ZnS QDs within a michelle/polymer coating has found that these NPs are able to penetrate the nucleus, similar to Lovric et al.63, of 'Xenopus' embryos, however cause no toxicity when present within these frog embryos for up to two hours72. Further investigation of CdSe/ZnS QD with an amphiphilic/micelle coating has also found QDs to be present with skin capillaries in mice73. It was further reported by Larson et al.73, that the coating on QDs is pertinent to the mechanism of uptake, as well as the location of these NPs in cells. Clift et al.66 studied the uptake patterns and mechanisms of three different surface coated QDs. It was found that both the negatively and positively charged QDs entered J774.A1 macrophage cells via similar active pathways, resulting in their location within endosomes and eventually lysosomes. Additionally investigation of the uptake mechanisms of different surface coated/charged QDs has shown positively charged CdSe core/ZnS shell QDs to be present within the EL-4 cells outside of a membrane bound vesicle, however, COOH QDs were demonstrated to be present within endocytic vesicles59. It was also highlighted that the amine coated QDs were more susceptible to a reduction in stability over time, in comparison to the COOH QDs, which were subsequently observed to maintain their structure, possibly due to their location within endosomes59. It was concluded from these findings, that the presence of the positively charged QDs outside of a membrane-bound structure could be associated with the increased cytotoxicity observed with these QDs over the 12 hour period, also suggesting that a reduction in stability could be relative to QD toxicity. The findings of Hoshino et al.60 are in contrast to that of Clift et al.50, where it was shown that both negative and positively charged QDs (COOH and NH2 (PEG)) respectively) showed a decrease in their fluorescent intensity at pH 4.0, indicative of a loss in their stability in this acidic environment (similar to that of an endosome/lysosome). The suggestion that a reduction in QD stability is associated with their toxicity however, is in contrast to previous research by Hoshino et al.60 who showed uncoated CdSe/ZnS QDs, to be present within T-lymphoma tumour cells outside of membrane-bound vesicles, although maintained their stability within these tumour cells for up to two weeks, causing limited cytotoxicity. Furthermore, the suggestion that QDs reduce in stability is in contrast to Xu et al.74 who indicated that Gelatin and sodium dioctyl sulfosuccinate (AOT) coated CdSe QDs maintain their stability due to an enhancement of their band-edge luminescence over time in a series of environments, including light illumination. The findings of these studies suggest that QD surface coating does have a significant effect on their uptake and cellular location and distribution. Problems are still paramount however, similar to those regarding gaining an understanding of the potentially adverse effects of QDs. Again, the use of completely different surface modified QDs is the main reason, but also the use of different cell types. Whilst this is also true for the biochemical effects, in regards to how QDs interact with cells, if the cells are immune cells (e.g. macrophages, or other cells expressing phagocytic properties) or not will have a profound impact upon how the QDs are observed to interact with these cells. It is clear therefore, that prior to the use of QDs in a clinical setting increased emphasis must be given towards understanding only those surface coatings, functionalisations and sizes (Fig. 2) that are intended for use in nanomedicine75. Despite this, initial investigation and use of QDs is already ongoing. A perspective of how the different surface and physical characteristics are perceived and questioned in regards to the current research knowledge and understanding. A further discussion of how these aspects relate to the use of quantum dots in nanomedicine is also given. Although much debate surrounds the materials used to synthesize QDs, it is in fact the characteristics of these NPs that intrigue clinicians for their use within a medical setting. Due to their size, heightened applicability for surface medication and novel light emitting properties of QDs, which include a narrow emission spectra and increased photostability, these NPs have been increasingly used as advantageous alternative laboratory based bioimaging tools compared to organic fluorophores both in vitro and in vivo76-84. It is these light emitting characteristics, specifically the ability of these NPs to emit light within the infrared spectrum; a wavelength of light capable to penetrate tissues and allow the visualisation of structures in vivo, such as tumours; that has enabled QDs to be proposed as beneficial, non-invasive diagnostic imaging and therapeutic tools for the identification and treatment of disease in the human body2,26,79,85. The advantages of using QDs as diagnostic tools were previously highlighted in a study by Gao et al.86, which examined the potential for cancer targeting using multifunctional NP probes based on QDs in vivo. It was reported that following both subcutaneous and systemic injection, the multifunctional QD probes efficiently accumulated within prostate tumours in vivo through the enhanced permeability and retention of the tumour sites, as well as the antibody binding of these NPs to the cancer-specific cell surface biomarkers. These findings support the conclusions of Wu et al.87and Kim et al.88 that also stated conjugated and multifunctional QDs to be effective probes of cancer cells, and further advantageous diagnostic tools in vivo. Investigation using non-conjugated QDs has also found these semi-conductor NPs to be highly efficient in the tracing of cancer cells in vivo60. It was reported by Hoshino et al.60 that QDs were highly efficient in the targeting and fluorescence of T-lymphoma cells, further supporting the notion that QDs are beneficial diagnostic tools in vivo. The ability for QDs to act as novel fluorescent probes has most recently been shown by Gao and colleagues89. In this study, the authors synthesised QDs with dendrimers to form a novel 'drug delivery' system to identify and target acute tumours in vivo. It was observed that these QD-dendrimer formulations actively gained access to the tumour cells, whilst eliciting limited toxicity at the concentration tested (1nM) and maintaining their stability within a biological environment over a period of 10 weeks. This study further shows the clear benefits of QDs for diagnostic purposes and that with the correct surface modifications can elicit a limited level of adverse effects. There are many studies within the literature that show QDs to be advantageous diagnostic tools in vitro and in vivo; thus ideal for use in a clinical setting. However, the predominant state of the literature shows that QDs, especially those with a Cd-based core, can elicit a heightened 'toxicity' that creates a sense that, in fact, QDs may not be an advantageous tool for nanomedicine. This however, is a common misinterpretation. As shown in the study by Gao et al.89, the particle concentration administered in vivo was 1nM, whilst the concentration used within other in vivo and also in vitro studies are at least ten times higher51,64. Such a difference within the administered dose, independent of the biological system being used (although this most certainly plays a key role in the assessment of NP-biological interactions68), will more often than not elicit a (significantly) altered response. Therefore, as the debate continues within the field regarding 'realistic' concentrations (or more aptly 'doses') of NPs exposed to humans90, it is imperative that, concomitantly an understanding of how QDs interact with the entire human body is determined; in order to realise their potential clinical applicability. Recently, this has been taken a step further to reality by Ye and colleagues91. In a novel study, in which non-human primates (rhesus macques) were exposed via intravenous vein injection to chloroform dispersions of phospholipid-encapsulated micelle QDs at 25mg/kg for up to three months (90 days). It was reported that after this chronic exposure period, no acute toxicity was associated with the QD exposure in any of the primates. It was stated however, that following chemical analysis (inductively coupled mass spectroscopy) high levels of Cd were observed in the liver, spleen and kidneys after 90 days. It was suggested by the authors91 that the breakdown of the QDs was slow, and that the accumulation of such heavy metals in the major organs of the primates could impact upon their health and contribute to a deterioration of their life-span. Although, as focussed upon within the present review, QDs are mainly identified as advantageous alternative diagnostic and therapeutic devices, as with many different nano-objects, QDs have also been suggested as potential drug delivery systems. Such a concept is thoroughly discussed and reviewed in the recent article by Ghaderi et al.92. However, in perspective, the use of QDs as a drug delivery tool within nanomedicine, whilst of course possible, is perhaps beyond the original perception of what QDs could offer to a clinical setting. Furthermore, with the many other potential drug delivery tools proposed for nanomedicine (of which the dendrimer is the prime example39) perhaps focussed concentration should be given to realising their diagnostic and therapeutic possibilities. Such possibilities will only be realised however, if clinical phase trials are conducted in an organised and collective manner. This will take time however, since the current literature and knowledge base regarding QD biological interactions is not sufficient. Although there is a plethora of research reports available, the inconsistencies are vast and have no collective, or correlation. It is therefore, important that clear, reproducible and representative biological systems are used93, as well as realistic QDs studied (i.e. those that are intended for use in nanomedicine and intentional human exposure). Furthermore, data regarding the actual use of QDs within a clinical setting is extremely limited due to (i) the unknown entity that QDs pose and (ii) the issue of ethical approval for their use within such a setting. It is essential therefore, that information to the first problem is gained with haste. As this will then provide clear evidence to overcome ethical issues and subsequently gain essential in vivo data concerning the applicability of QDs for use as a diagnostic and therapeutic tool within humans. QDs elicit a number of novel physico-chemical characteristics that have allowed them to be considered as possible advantageous tools within nanomedicine. Despite the clear benefits proposed by QDs, heightened concerns have been raised as to their exposure to humans and what impact they might have upon human health. Increased research therefore has been performed in order to try and understand how QDs may interact with a variety of different in vivo and in vitro systems, and an increased knowledge base has been gained regarding this interaction and its subsequent biological effects. Despite this, limited information has been obtained that is useful towards understanding if QDs are applicable to a clinical setting in order to be used as either therapeutic or diagnostic tools. Predominantly, many of the studies have aimed to answer one specific scientific question (whether pertinent to human health, risk assessment or a comparison between QDs and another NP type). Although such information is essential to gain a clear understanding of how QDs interact with different biological systems, as clear overview, or outlook towards gaining an insight into how applicable QDs are for clinical use. It is essential therefore, for further research to be performed using a specific array of QDs with the same size, surface modifications and materials with a specific set of in vitro and in vivo systems that perfectly mimic the environment as found in the human body. Furthermore, the consequences of a prolonged QD exposure upon human health are not clear, and not well studied. Thus, consideration as to the chronic effects of QDs, as well as the impact of multiple exposures over time of QDs upon human health is paramount towards using these NPs within medical applications. Therefore, much research is still necessary in order to realise the potential of QDs as a tool within nanomedicine, but with the knowledge base already gained over the past two decades, both upon QD-biological system interactions and upon the NP-cell interaction in general, it is possible to envisage the advantageous properties of these materials for the benefit of human health. Corresponding author: Martin J. D. Clift, BioNanomaterials, Adolphe Merkle Institute, University of Fribourg, Rte de l'Ancienne Papeterie, Marly 1, 1723, Fribourg, Switzerland. Tel #: 0041 26 300 95 17, Fax #: 0041 26 300 96 24, e-mail: martin.cliftch.